Apple on Friday confirmed reports that it recently acquired book analytics firm BookLamp —dubbed the "Pandora for Books" —in April to bolster its fight in the e-book sales market, bringing better discovery and analytics to its digital storefront. Citing sources familiar with the matter, TechCrunch reports Apple bought BookLamp and its so-called Book Genome Project technology for between $10 million and $15 million. The company confirmed the sale to Re/Code minutes later. 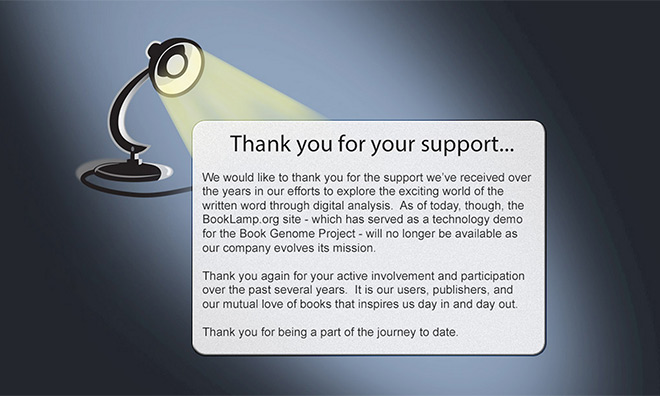 Based in Boise, Idaho, BookLamp developed a system of digitally analyzing book content, which played out as a tech demo in the Book Genome Project. Like the similarly-named "Music Genome Project" from Pandora, BookLamp's solution looks to offer recommendations and discovery of new material by breaking apart and analyzing books using natural language algorithms. Apple is thought to have acquired the startup for in the iBookstore, which offers e-books to iOS and OS X device owners but does not yet have an effective recommendations system for content discovery. Like the iOS App Store, Apple is likely looking to improve generated suggestions through BookLamp's specialized software that can parse words and sentences to look for various metrics like genre, themes and even pacing. As seen in the above samples snagged by TechCrunch, the Book Genome Project is able to pick out keywords, phrases and other data, map them out in a chart and compare the findings with other analyzed books. Pacing of thematic elements is accomplished through another algorithm that recognizes the same metrics as they appear in a novel. Apple was reportedly already contracting BookLamp's services to automatically digest book data for demographic targeting, but the tech could potentially be rolled into the iBookstore much like app search engine Chomp was in 2012. BookLamp also counted Amazon as one of its customers, along with publishers in New York. "At first Apple and BookLamp talked about growing their contract, but then they talked more from a strategic standpoint," one source told TechCrunch. "What Apple wanted to do was, instead of contract, they wanted to make sure whatever work was done was done just for them." Apple's endgame is unknown, though BookLamp's toolset presents a number of possibilities including targeted advertising, tailored book "playlists" and smart recommendations. "I can tell you that in the next year to 18 months you will see some fairly major initiatives focused on books and reading coming out of Apple," the person said.